Judgment, self-criticism, or fear of failure. These are what keep us playing small. The secret belief that we are unworthy of the things we crave; a wonderful love, a meaningful career, or creating a masterpiece. We are all worthy and the things we crave are absolutely available to us. However, we must be willing to stretch beyond our current form. We must be able to take risks, to fail at first, to keep getting back on the bicycle until we can succeed. Mindful engagement means allowing our fears and negative self-talk to come up and have its say, then do it anyway. Failing wildly is the only way to fail. Once it happens once or twice, it loses its stigma. We can realize that failing doesn’t end us, we don’t actually die from it. We learn. 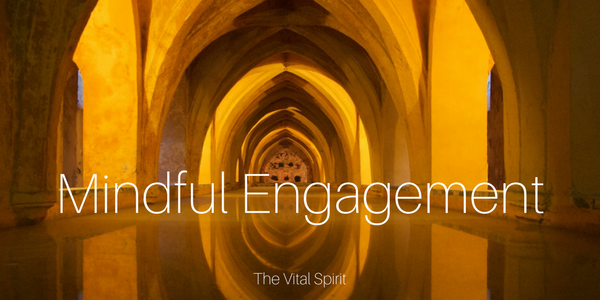 Mindful engagement means we get to stay in the moment and grow stronger, smarter, and more successful each time we reach out beyond our box.